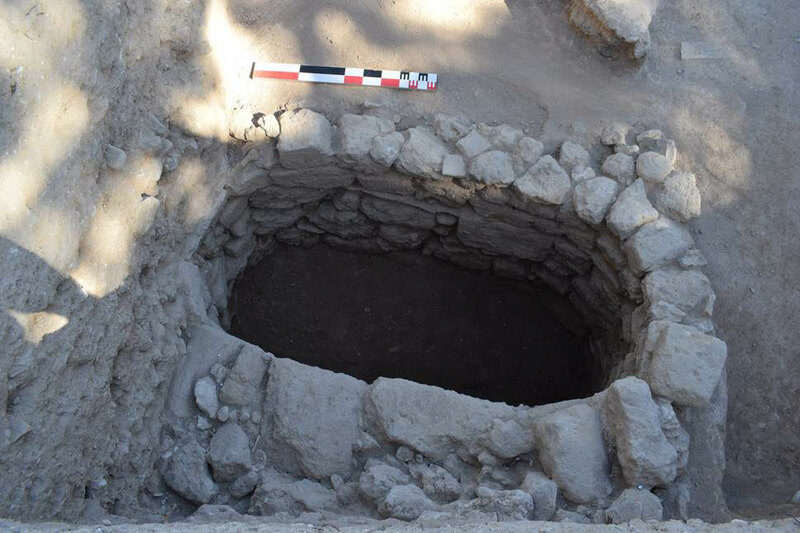 Cyprus Department of Antiquities said that works on the sewerage system of Larnaca city continue to bring to light archaeological discoveries from ancient Kition. Some of these are considered to be extremely significant and of exceptional historical value, as for example a section of the defense wall of the ancient city of Kition situated on Teukros street. 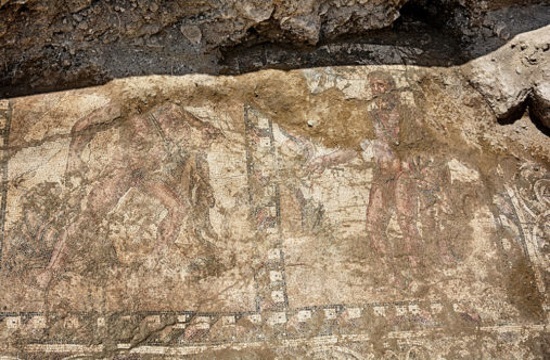 Another unique Roman mosaic was unearthed in 2016, measuring 19×4.60 m and depicting the Labours of Hercules. As pointed out by Head of Antiquities Department, Dr Marina Ieronymidou-Solomidou, it is the first time that a mosaic has been located in Cyprus with such subject matter, i.e. the Labours of Hercules, usually associated with baths. According to the former there are five panels, two of which have been totally uncovered and another three in part. For the work to be unveiled in its entirety, archaeologists are trying for two years to overcome some practical issues since the mosaic extends diagonally towards apartment blocks as well as a private residence. 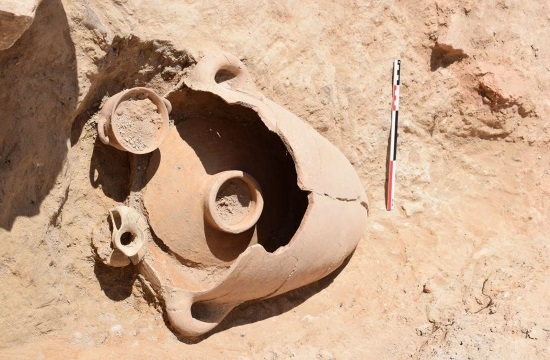 Based on a document submitted a few days ago to the Cypriot Parliament by relevant Transport Minister Vasiliki Anastasiadou, work on the sewerage system of Larnaca recently unearthed a multitude of ancient artefacts made from various materials. Specifically, many clay pots were discovered, which, as usual, make up most of the finds. Metal tools were also located and objects of prestige such as bone tools and jewellery, faience artefacts and imported raw materials such as semiprecious stones and gold jewellery. The finds of each excavation are being examined by experts in each category of material (e.g. ceramics by specialists in ceramics) and also in groups of findings, such as the findings of a tomb, to come as close as possible to the historical conditions that created an archaeological assemblage; the key goal of scientific archaeological research. Specifically regarding the gold jewellery in question, about which MP Christos Orphanides asked to be informed, Mrs Anastasiadou, according to the ‟Phileleutheros” daily, cites in her letter that compared to the other categories of finds , the gold jewellery are small artefacts, limited in number, found in tombs from Hellenistic (310-58 B.C.) and Roman times (58 B.C.-330 B.C.). Their small number and the fact they have been found sporadically in burials and not in large assemblages make it evident that they were valued objects to their owners who were ordinary members of ancient Kition society. Furthermore, dozens of ancient carved tombs dating back from the Classical to the Roman period were found on Griva Digeni Street (Drosia district) and on Agisilaou, Aeolou, Gordiou Desmou, Liperti and Kultur streets. Most of the burial monuments that have been excavated were unplundered as, more specifically, the 10 tombs found on Gordion Desmos Street offering the Department of Antiquities the opportunity to collect valuable information about burial customs in ancient Kition. During excavation work on the sewerage system in Teukrou Street, several clay female figurines were also located which may have come from the so-called shrine of Kamilarkon, found and excavated in 1894 by British archaeologist J.L. Myres. The results of his excavation were published in the ‟Journal of Hellenic Studies” in 1897. These excavations unearthed the foundations of a temple with many fragments of stone and clay statues and figurines in the Kamilarka district, where Teukrou and Nikodimou Mylonas Streets converge nowadays. In her letter, the minister points out that most of these statues and figurines are female, showing the ‟goddess with raised arms”, various types of Astarte, the goddess with child, Kourotrophoi, women worshippers and musicians. There are also a few male figures such as musicians, riders, worshippers etc. The findings date the use of the site as a sanctuary from the Cypro-archaic to the Hellenistic period (7th-3rd centuries B.C.). It comes as no surprise to the Cyprus Department of Antiquities that archaeological remains of great historical value are still being discovered, since it is widely known that under the modern city of Larnaca there exist layers of the place’s older history, initially inhabited in the Early Bronze Age at the end of the 3rd millennium B.C. Concerning the construction works of the sewerage system, the Department of Antiquities, in cooperation with the Larnaca Sewerage Board, is proceeding, where necessary, in altering the route of sewerage pipes, so that those archaeological remains that cannot be moved, are kept in the ground and made available to researchers in the future.